In 1965 Coury moved to Oregon convinced of the potential for growing great Pinot Noir. 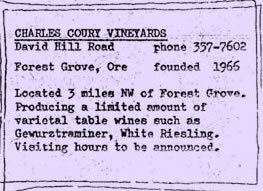 In 1966 he purchased 140 acres near Forest Grove, then known as “Reuter’s Hill or Wine Hill”, now David Hill Winery. Coury, a meteorologist with a master’s in enology from UC-Davis (thesis titled “Cold Limit Amelioration Hypothesis”), theorized that vinifera varietals (i.e.,Pinot Noir) produce best quality wine when fully ripened at the end (the limit) of their growing season. Match the grape variety to the climate. Pretty basic stuff now but not so in the 1960’s. 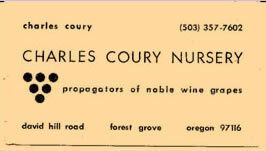 Coury also operated a nursery. The “Coury clone” of Pinot Noir is still planted today. In 1978 Coury closed his winery, moved to California and founded Cartwright Brewing Co. In retrospect the early success of the Oregon wine industry is due in no small part to Coury’s academic and intellectual work.